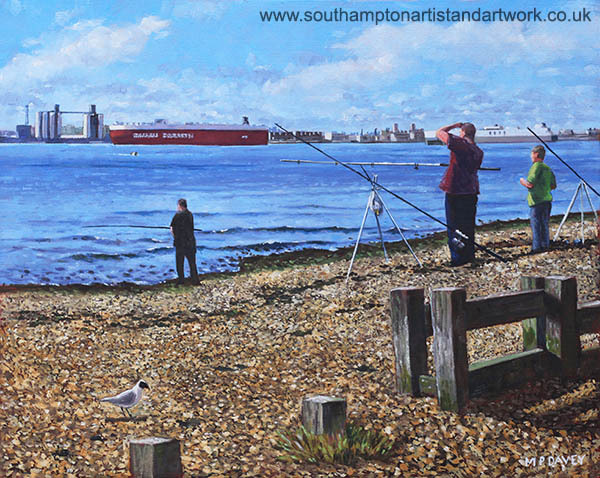 A group of people are seen fishing in Southampton Water, on Weston Shore, Southampton, during a sunny winters afternoon. The shore is made up of shingle, and this location is near to the car park. On the opposite side of the water is a part of the port of Southampton where a 'Wallenius Wilhelmsen' ship is in dock, next to the distinctive silos which are a local landmark at the entrance to the port. The painting is done in oils on a canvas board measuring 16” x 20”, and was painted during autumn 2013, based on a photo taken during January of that year.